IT has been a long journey for both Waratah and Southern Districts. Waratah is a powerhouse which holds a dominant winning record over the past seven years. They were defeated in the 2016/2017 season but now are looking for back to back premierships as they head into Saturday. The Crocs, on the other hand, will be making their first Grand Final appearance in history. The Crocs entered the women’s competition in the 2013/2014 season but have not seen a finals series until now. After years of underwhelming seasons, the Crocs enlisted coach Tarmon Elliott to turn the team around. Elliot has delivered in spades by bringing a strong culture, new recruits, and possibly their first flag. After defeating Palmerston, Southern Districts could not be more ready to face Waratah for the ultimate prize. This match will be like a game of chess. What makes Waratah and Southern Districts different than other teams is their players have the ability to shift into different roles. This makes matchups hard to predict in this battle of tactics. Tayla Thorn was elite down back but can also play in the midfield or forward. However, considering the dangers of Amy Chittick and Lauren O’Shea, she will most likely stay in defence. She will be well supported though by Maria Moussa, who had a blinder last weekend with the most defensive rebounds for Districts. In the Warriors defence Rebecca Pryer, Isabelle Rapson, and Lisa Roberts will make it difficult for the Crocs to score. Kelsie Patterson kicked three majors last week but it could have been more if she kicked straight. Tahlia Holtze had a very quiet game last week, but the Districts will need her to have her kicking boots on to breach the Tah’s defensive wall. The fight in the ruck contest may have Waratah at a disadvantage. Ebony Miller and Indy Sleeth might as well be tall midfielders as they cover the ground exceptionally well and are proven goal kickers. Joanna Kolodziej and Julianna Kerinaiua will have a tough fight in this contest. As for the midfield battle, there could be as many as twelve different rovers rotating throughout the game. 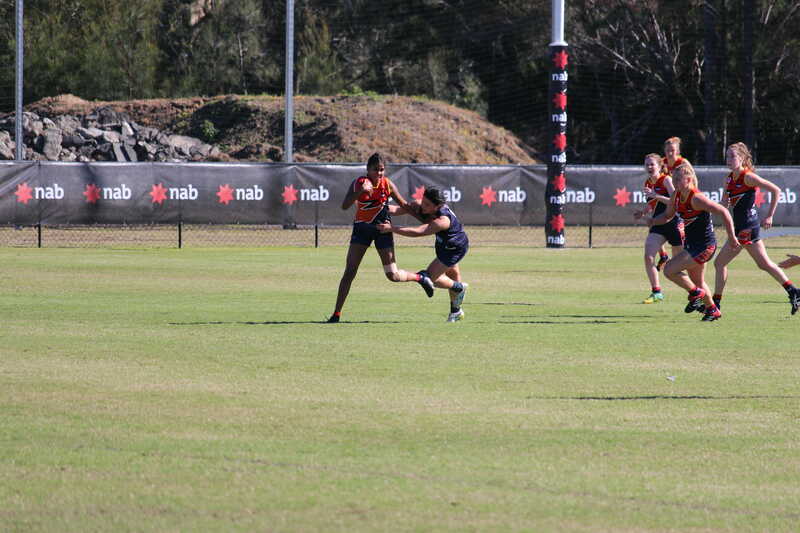 Lateesha Jeffrey and Bella Clarke may push up or back from the centre, but Megan Craufurd is the constant tagger that shuts down key midfielders. She may have the job on Sharona Bishop who is in fine form. Madeline Gault is similar to Craufurd but plays more of a run-with role rather than a shutdown tagger. Gault would be a perfect opponent for Jeffrey if she plays in the midfield. Waratah has the advantage in this match as many players on their list have seen at least one premiership. Lisa Roberts and O’Shea have been in this position six times for five flags. The Crocs are a very different story, unlike their opponent, this level of competition is completely new to them having qualified for the first time. They were the underdog last week and beat the odds, and defeated Waratah in their last outing. They just need to dig in one more time and given it is the Grand Final, and anything can happen. 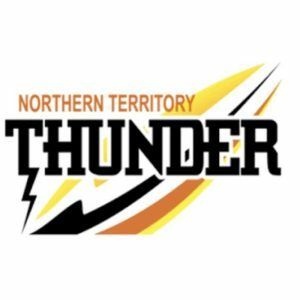 IT is Round 14 of the Northern Territory Football League (NTFL) Women’s competition and with finals five weeks away, the contenders for this season’s premiership are becoming obvious. Up first, Southern Districts return to take on Tracy Village. The Crocs were average in their first match back from the holiday break, but with the Razorbacks’ current record, the Crocs may dine on Bushpigs. The following match is the main event where the Darwin Buffettes face the Palmerston Magpies. The Buffs’ have enjoyed an easy run of victories lately, but on Saturday, they could receive a wake-up call from the Pies. At the same time at TIO Oval, St Marys will battle the Wanderers. The Saints will be eager to continue their good patch of football. Lastly, reigning premier, Waratah wounded from their previous defeat, needing a convincing win over Pint. If the Crocs ever needed a tune-up match, this is it. Southern Districts forwards, Tayla Thorn and Charlie Deegan have been missing in action in recent games. The Crocs would be very anxious to get this pair up and firing this week. Tracy Village’s defence was overwhelmed by the Saints’ pressure last weekend and if Thorn and Deegan kick straight, it could prove disastrous for Tracy Village. Razorbacks midfielders, Kristy Irvine and Zhoe Clarke know how to win the clearances, but their forwards are always last to the ball. This must not happen against the Crocs’ backline because Lateesha Jeffrey will send the ball 50 metres in the opposite direction. The Southern Districts’ main problem has been accuracy in front of goal, and they will need to tighten up their skills before they meet Palmerston next week. After the Magpies defeated the reigning premiers last Sunday, it is hard to choose a favourite for this match. Darwin has not beaten Waratah all year, but the Magpies will provide a good challenge. Palmerston should be welcoming back Tabitha May after a stint on the sidelines. May, Natasha Medbury and Janet Baird will face possibly the most balanced midfield in the competition. The main threat for the Pies is Machaelia Roberts, whether playing forward, midfield or half-back, she can prove a menace on the ground. However, she is not the only problem. Jemma Iacono, Dominique Carbone, Kylie Duggan and Tikesa Docherty-Cole are very capable of picking up the slack. This is another game where it could be head or tails, yet the Buffettes might have more to play for after their easy run of wins. It hs been a long hard season for the Eagles. Under-18 representative, Arthurina Moreen has proven to be the standout for the Wanderers up forward. Unfortunately for Moreen, she has not had the midfield to feed her. With the added support from the Adelaide Crows (Danielle Ponter, Jasmyn Hewett, and Ailish Cosidine), St Marys should prove too powerful for the Wanderers. Mathematically, the Saints can make finals, but logically a win here is just a consolation prize. Pint is one win away from securing a top five spot. The only problem for the Queen Ants is they must defeat Warratah on Sunday. Normally Waratah would come in as heavy favourites, but with players like Madeline Reisinger, Sherayn and Christine Puruntatameri possibly missing another week, Pint has a chance. Erin Hetherington has been sensational across half-back, carrying as much influence as Cassie Henderson does in the midfield. However, Warriors stars, Lisa Roberts, Madeline Gault, Lauren O’Shea and Sharona Bishop are still a very lethal combination. If the Queen Ants manage to pull off the win, it will provide serious momentum for them in the upcoming weeks. 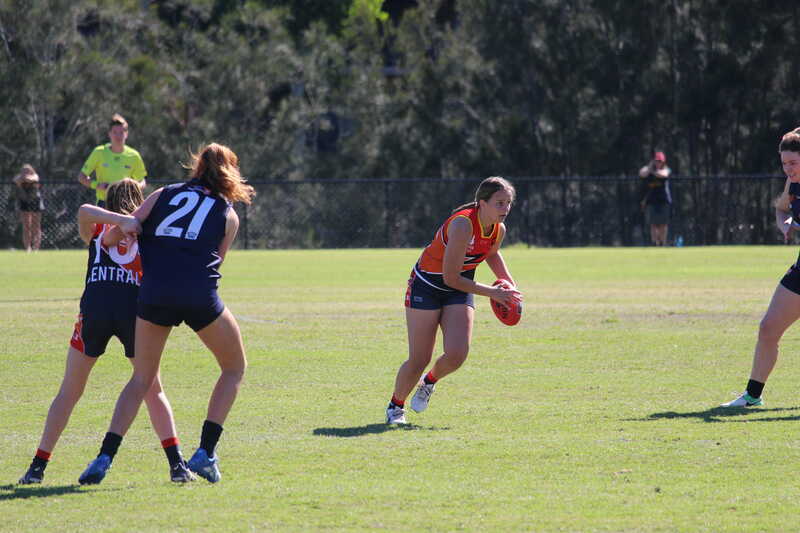 LAST weekend’s round of footy saw one upset in the Northern Territory Football League (NTFL) Women’s while the rest of the top teams crushed their opposition. The Buffettes showed the Wanderers no mercy last Saturday as the Darwin stampede proved too much for the Eagles. Meanwhile, the Saints roasted the Razorbacks after another disappointing result for Tracy Village. Nightcliff was the next to fall to Pint, the Queen Ants seem to have regained their competitive edge. On Sunday, however, the trend of favourites would fall to the underdog. The Palmerston Magpies defeated the reigning premiers Waratah in a thriller by two points. When Darwin defeated Nightcliff the previous week, the damage could have been much more extensive. This time the Buffettes made use of every scoring shot they had. Zoe Anderson was the star with four goals to her name, Melinda Taylor kicked two with the rest of the Buffs being single contributors. Machaelia Roberts was electricity running through the ground, the Eagles had no one to who could catch her. Under 18 representative Authurina Moreen was the Eagles only goal kicker while the Buffettes had nine. Darwin has enjoyed a past few weeks of easy victories, but this week they will have to face the Magpies who have just toppled Waratah. Palmerston will be no easy kill as this match could prove to be the game to watch. Darwin Buffettes: Z. Anderson 4, M. Taylor 2, M. Breed, M. Roberts, C. Whan, K. Duggan, K. Williams, M. Turner, T. Bullen. On Saturday, St Marys unveiled an arsenal of Adelaide Crows that took control of the midfield and left the Razorbacks in their wake. The group was comprised of Danielle Ponter, Jasmyn Hewett, and Irish talent Ailish Considine who got her first taste of Australian football. Considine contributed well and Ponter was outstanding, while some women looked clumsy Ponter was slick. Hewett was no different, as the tall timber contested well in the ruck and racked up disposals like a common rover. Alana Coombes was another who shined for the Saints kicking two goals for the day. Coombes would have kicked a bag if she was more accurate in front of goal. The highlight of the match saw Ponter and Kristi Irvine go head-to-head in the last quarter. Irvine’s clearance efforts were impressive, but Ponter’s composure and skill through traffic were nothing short of superior. The Saints now have a sniff and with the top five spots now deciding finals, the next few weeks very interesting. Tracy Village: K. Irvine 2, J. Oxspring. St Marys: A. Coombes 2, S. Maxsted, M. Gunderson, F. Frances, S. Edwards . In a slow start to the first term, Pint clicked into gear during the second. 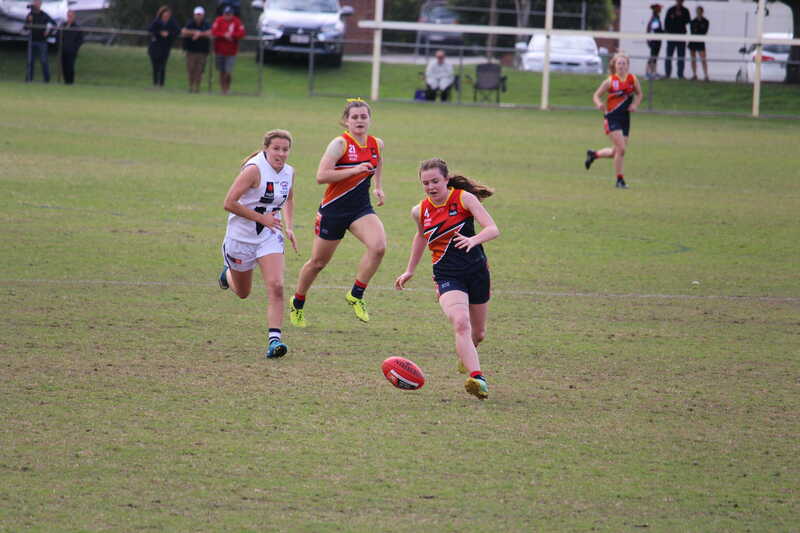 Cassie Henderson continued her follow-up work from Tracy Village by racking up the disposals and booting two goals. Forward Louisa Bahen Wright slotted a pair of her own majors while Danielle Suddaby provided a good target as well. The Queen Ants drifted off in the third quarter, but with Nightcliff unable to inflict any real damage, the game was never in doubt. Pint’s inconsistency of not playing all four quarters may prove costly in the future. This effort against the elite teams of the competition simply will not do. Nightcliff: J. Puautjimi, J. Hill. Pint: L. Bahen-Wright 2, C. Henderson 2, D. Suddaby, E. Fittock. Sundays was the heavyweight game of the round and it did not disappoint. From the opening quarter, the Pies started off with a bang kicking the first two whilst keeping Waratah goalless in the first quarter. Waratah would bounce back in the next two terms as the combined efforts of Lauren O’Shea and Sharona Bishop saw Warratah hit the front. It seemed like history was about to repeat itself, but Natasha Membury’s Pies fought back in the last quarter to win the match. It is a defining win for Palmerston, they have now beaten all top five teams, proving they are a real premiership threat. Waratah: S. Bishop 3, L. O’Shea 2, A. Love.